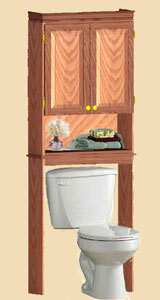 This tall version of the classic wall vanity is designed to fit over the commode. It can be moved more easily because it does not have to be fixed to the wall. Made from solid hardwood and veneer, it has two raised panel doors that hide an adjustable shelf. The bottom open shelf is perfect for holding soaps, air fresheners, a tissue box or bathroom decorations. The crown moulding adds a distinctive elegant look. You can build this useful project fairly quickly and can easily finish it to match your bathroom d�cor or sink vanity. Finish used for this project: water-based Flecto Varathane Diamond Wood Finish, in a satin sheen over Minwax Wood Finish (stain) #223 Colonial Maple.